Arrow Sewing Cabinets: Friday Giveaway! Happy Friday everyone! Due to some Facebook restrictions, we need to change up the way we're doing our giveaway today! An awesome rolling tote! Just leave a comment below, and you'll be entered to win! We'll give everyone until Sunday at 9 am EST to enter! We're still hoping to have 2500 Facebook fans by April 30th so that we can pick two lucky winners instead of one to receive their choice of a Gidget II or a Chair-y! Tell your friends! Comment #47 Robin K. From North Carolina! Robin, please email cs@arrowcabinets.com to claim your prize! Great to have totes for taking our sewing machines with us to classes, etc. That would be so nice to have! What a terrific item! Can think of a number of uses for this! 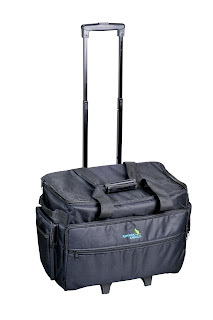 The rolling tote would be a great way to transport my sewing machine. I'd love to win the rolling tote! I enjoy going to quilt retreats/camps, and this would be perfect for my sewing machine & supplies! I would love this! Such a cool idea!!! THey're nice - thanks for the giveaway! That is a really nice rolling tote and I would love to win it! Facebook is having all sorts of problems today, it seems! This tote would be awesome to have! I would love a rolling tote so I could take my sewing anywhere easily! Thanks! I love it! Awesome giveaway! Wow! What a great giveaway. Thanks for the chance. I love rolling totes! They are so convenient and easy for classes and clubs and church service sewing. I would give this one to my sister for her birthday coming up! Would come in so Handy, Nice Size Bag!! I could definitely use one of those! TGIF !!! Love the rolling tote! What a great prize! Arrow is so generous. I'm just starting quilting and I need all the help I can get for organizing! Looks like enough room for many transportable projects . . .since we all know we have to have a project to work on no matter where we go! This would be great. Sorry about the fb stuff. That would be wonderful to have when I teach! I would love to win this...thanks for the chance!!! What a great prize!!! Can't wait to see who wins! Please pick me, need something good in Alabama. What an awesome give-away! Arrow Sewing Cabinets rocks!!! Need one to carry all my things for quilting retreat. Rolling, rolling rolling, get that sewing on! You ALWAYS have the BEST give-a-ways!!! Thank you for the opportunity! I would love to win your rolling tote. Thanks for the giveaway. Love that. Too bad about the FB contests. hmmmm...I can see other crafting possibilities w/ this!!! What a great giveaway - you guys rock! Love the tote. Would be great to transport my FW to class in. I just can't imagine why everyone doesn't click the like button. I bet they would like to have the prize so hit the LIKE button!! Come on we need 2500 you ca do it I know you can. A rolling tote would be a pure delight...and so much easier on my back!! My sewing machine said it would be happy travelling in one of these. Ok, here is my Friday comment. I WANT, I NEED, and I will congratulate who ever actually wins if I don't. Would certainly love to have it--and congratulations to whomever wins it! That is cute and fun to win! Would love to have this for going to my classes and workshops! Would love to have it. Nice to have a rolling tote when I take my machine to Mom's. I've been traveling a lot from PA to OH to help my parents. This would come in handy for transporting my sewing machine. Oh, I really need a rolling tote! what a great giveaway. I could really use one of those. oh I would love to own that tote! Love the machine tote. Would be so nice for sewing classes. Rolling sewing machine fun, fun, FUN! How handy. Count me in please. Oooohh that would be a great thing to have! Pick me! Pick me! I have a portable tote for my sewing machine but it would be nice to have one for my embroidery machine also. What a great giveaway! Thanks for the chance to win!! Thanks so much for offering this! It will be a great asset to whoever wins it! Very nice! That would be awesome to have!! I would absolutely LOVE to have that! That is awesome! A roomy tote makes taking your sewing with you sew much easier! Thank you for the wonderful give away chance! My sewing machine certainly would be happy to be seen in this! Another wonderful gift anyone would love to have. What a great gift this would be for me or my sister Wanda. I call myself a traveling embroiderer! lol!! I take my machine with me everywhere I go, making curling iron bags, potato bags and blankets. Got my fingers crossed for this one!!! What a great bag! I can see my sewing machine fitting nicely inside as I head out the door to Quilt Guild meetings and sew-ins! I could definitely use that for traveling with my sewing machine, with a daughter in Maine and another in northern Michigan I could put that tote to great use so pick me. This would be a great addition to my new sewing hobby..so many items that don't have a home yet! Ooh, that would be a lovely gift to win! Oh, would love to win...what a great giveaway. Thank you! I didn't realize you had a blog. I'm a new follower here. Nice to see you here and on Facebook. Whoo-Hoo! Thanks for the opportunity to win, you guys make such lovely things! Where do we find out who won? Nice Giveaway, would like to win! This is a great giveaway! Thanks for the opportunity to win. Hello =D This aging chickette sure could use a little wheeled help with her own "rolling along". Happy weekend! I woud like to win this for my granddaughter and me. Iwant to teach her crafting and sewing like my grandmother did for me. I love you, Ellie. I've been wanting one of these for a long time. Hope I win it! What a great tote bag! This would make it sew much easier to go to sewing classes!! I am Chris Pigott. I am teaching my Granddaughter the love of crafts. We're making doll clothes together. Winning something from your company would be wonderful! Great tote...good luck everyone..and me! That would be "sew" great to have for my next quilt camp. I'm "sew" glad that I've still got a chance to win this! Very nice tote, would have been nice today to have one as I picked up my machine today. traveled over 2 hour to get it.. GOOD LUCK to all. Good morning Arrow Cabinets....oh that tote is going to look *sewing* great to all my friends when I show up wheeling my machine into classes and would really be nice to have. Good morning and fingers crossed. The rolling tote is lovely as are your cabinets!! Yea, I didn't miss it. It's perfect because the rolling case is exactly what I have been shopping for. I would love to win the cabinet! That is awesome! Too bad about FB though - that made it so easy! AWESOME ROBIN!!!! YAY, that is my friend from NC! CONGRATS! Eagerly crossing fingers! Desperately needing some help with organization! Would love to have one of these. What a great prize! Thanks for the opportunity! Can Canadians win? Would love a chance to win this great tote!